White flag has emblem of a map of Kagoshima, land part in black and Sakurajima island in red. Adopted 24 April 1967. White flag with red disk surrounded with black crescent-like shape with an nick in fly part. 2:3. The prefecture flag was adopted on Mar 10th 1967. The flag depicts Satsuma Peninsula and Osumi Peninsula in black and Sakurajima island in red. 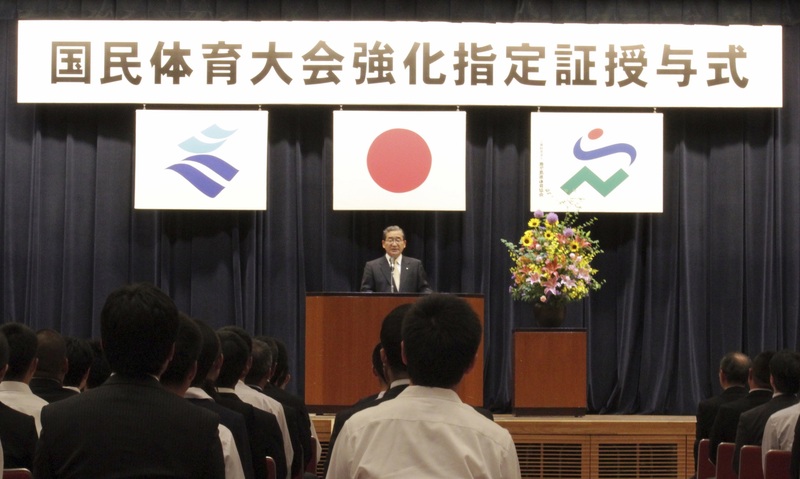 Kagoshima Prefecture uses another flag. I'm not sure that it is fully replaced the old flag. This flag is white with blue symbol. This page describes the logo (adopted March 1994 [although the page says the emblem was adopted March 1967, rather than April]) alongside the prefectural emblem. 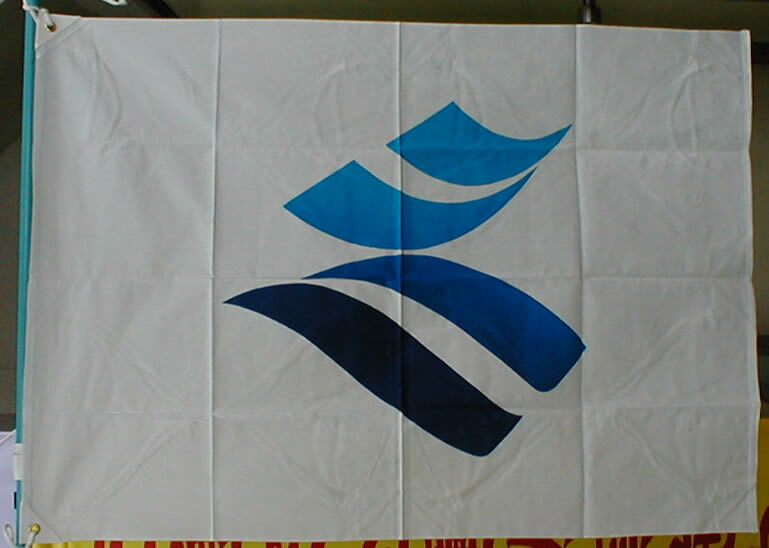 The logo is made up of blue curves, two sweeping up and two down, a motif of the wind and waves, symbolising the abundant nature/spontaneity of Kagoshima. The design also expresses Kagoshima's initial letter 'K', making an image of Kagoshima looking to the future with liveliness. Seeing as Smith singled Kagoshima's flag out as a state flag even before this logo was adopted, it seems quite likely that the emblem flag is restricted to goverenment use of some sort. The description of emblem, as well as explaining the shape as a map, says that it symbolises Kagoshima enhancing the feeling of love for one's home, the citizens strongly maintaining awareness, and making progress towards the future. As far as I know, only Metropolitan Tokyo officially adopted a white symbol flag as well as symbol mark besides local governmental purple flag. The Kagoshima's blue one is also symbol mark but not official symbol flag of the prefecture. Kagoshima Prefecture symbol mark was adopted in Mar 1994 which depicts blue wind and wave in a form of the prefecture initial K. The symbol mark represents rich nature, breath and an image of the prefecture which advances rapidly to the future.